Michael Stidham, born 1957 in Neptune, New Jersey, was born into horse racing. His father George Stidham, was a jockey and trainer. 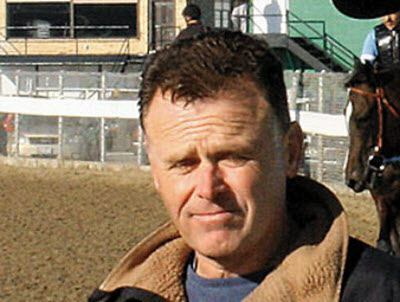 George also served as Bill Hartack’s business manager and part-time agent before becoming a trainer. George Stidham passed away April 1, 2005 at the age of 78. Mike learned the trade under the watchful eye of his father, from the ground up. Starting out as a hotwalker and groom, working up to a position as an assistant trainer. Mike spent two years in college, setting his sights on becoming a veterinarian before deciding to become a trainer. He worked for his father in south Florida and began training on his own at Tampa Bay Downs in 1978 when his father sent him to the Gulf Coast with horses that did not fit at Gulfstream Park. In 1979 Mike saddled his first career winner. He moved to California in the early 1980s and trained for Elmendorf Farm when it was owned by Max Gluck. Returning to Florida after two years out west, Mike assumed a private training job with the LaCroix family’s Meadowbrook Farm. He has found his niche in the Midwest the past several years, in Louisiana, Texas, Kentucky and Illinois, where he maintains a high-percentage outfit. Mike is the proud father of three daughters; Stephanie, Samantha and Camile. Mike will train horses for Dare To Dream Stable based at Arlington Park, Churchill Downs and Fairgrounds in New Orleans.